Yesterday I picked up Lagunitas Brewing's The Waldos' Special Ale. Today I'm drinking it! 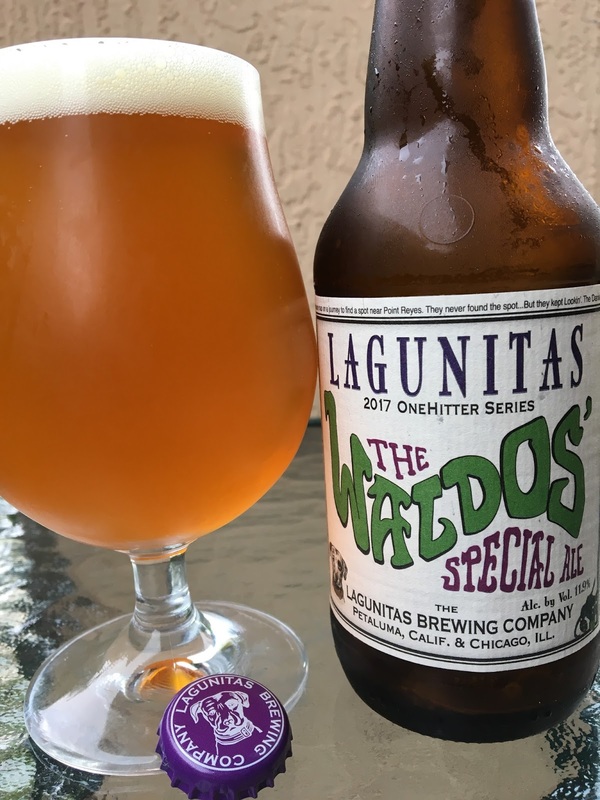 According to the label, "the dankest and hoppiest beer ever brewed at Lagunitas was made with help of the Waldos for all treasure hunters." The website part of the story, seen below, says 4:20 though that label says 4:19 and doesn't mention Louis Pasteur. Probably space and "drug reference" choices! So I guess this beer is a Triple IPA? I don't know, but it's 11.9% alcohol. Part of the 2017 OneHitter Series. And I guess the purple cap is a warning and/or a liquor store anti-theft identifying piece. Fruity orange and peach jam, lightly tropical aroma. Sweet, fruity orange and peach marmalade flavors with a very rich texture. Spicy, hoppy balance as well. Pine, dank, green, resinous, yet never overly bitter considering the rich sweet start. Alcohol is dangerously hidden though you will taste and feel it in your chest on the way down. Great beer! Where's Waldo? In my belly! Check it out! "In 1971, the Waldos met one afternoon at 4:20 in the front courtyard of their school near the statue of Louis Pasteur. They set out in a '66 Impala armed with a "treasure map" on a journey to find a secret garden near Point Reyes. They met there at the same time every day and continued their quest. They never found the secret garden....But they keep lookin'. The dankest and hoppiest beer ever brewed at Lagunitas was made with help of the Waldos for all treasure hunters." "Good with Beer-battered Twinkies Con Queso…you can find out why if you google 'Waldo 420'"